The Big Apple is arguably the beating heart and soul of the United States. Viewing New York City from the air is one of the most unique and striking ways to see all of this famous city’s most iconic sites. 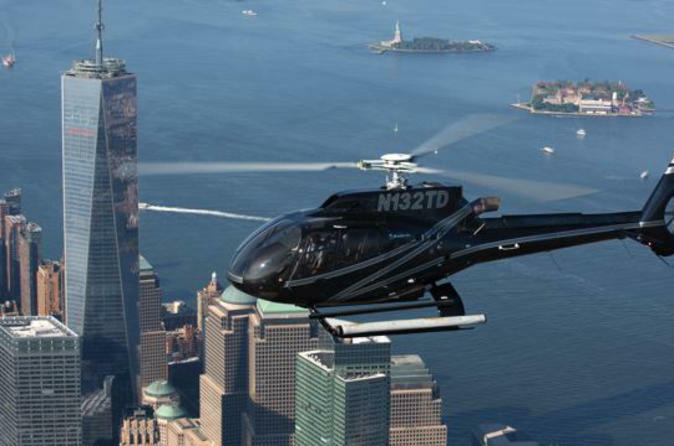 NYC helicopter tours are exclusive, exciting, and offer incredibly rewarding views of many of the city’s highlights. Whether you want to surprise a loved one or splurge on the tour of a lifetime, these are the best helicopter tours NYC has to offer. 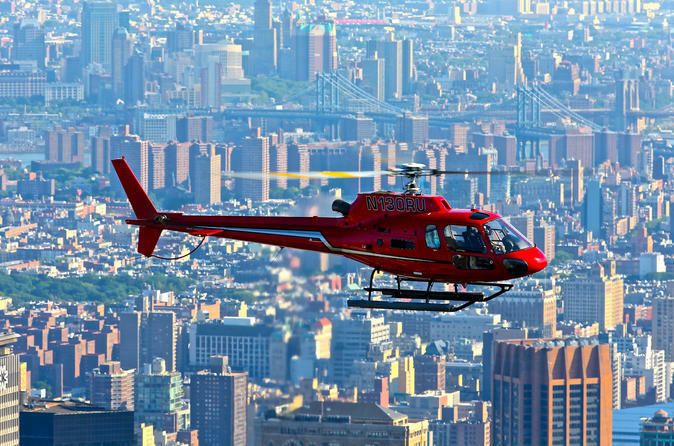 We’ve reviewed five of the best NYC helicopter tours and highlighted what makes them stand out . Pick the tour that’s best suited for the type of experience you want to have in New York City. Take to the skies for a whirlwind helicopter tour of NYC which hits many of the city’s famous landmarks in just 15 minutes. From start to finish, this tour is packed with all the heavy-hitter iconic sites. You’ll lift off from downtown Manhattan and start by viewing some of New York City’s most famous buildings including the World Financial Center, Empire State, Chrysler, Woolworth, and Met Life. Next, you will zoom over the Hudson River to get a bird’s eye view of Ellis Island, the site where over 20 million immigrants were processed during its 60 years in operation. Coming face to face with one of the most famous landmarks in the world on Ellis Island, the Statue of Liberty, is a natural highlight. You’ll then continue up the Hudson River during which time you’ll be treated to the most stunning views of the Manhattan skyline from a perspective that very few ever experience. The tour continues until the George Washington Bridge before turning back towards your starting point. 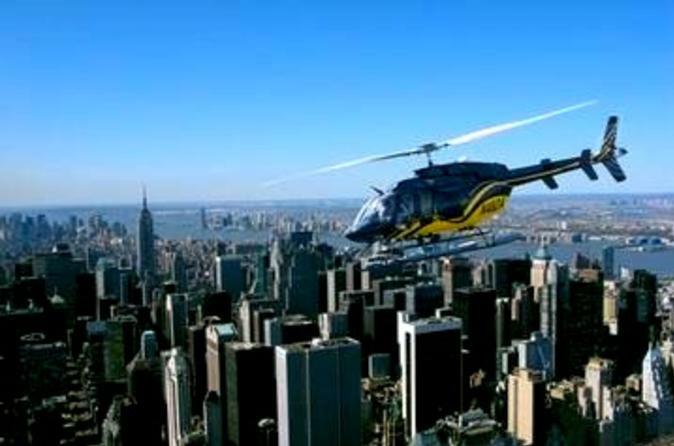 Exhilarating and efficient, this NYC helicopter tour is recommended for those who want to see and experience the most in the shortest amount of time. It’s also easier on the wallet than some of the other tours mentioned. This is a cheap helicopter tour of NYC that you can have at a reasonable price without sacrificing any of the highlights. There’s no better way for first time visitors to New York to get acquainted with its most famous city. A helicopter tour with fantastic aerial views is the best way to see the city without having to contend with the crowds, lines, and hustle that takes place on the streets below. See all of New York City’s most famous sights in just 15 minutes or less with the Manhattan Sky Tour. The first photo opportunity comes just after lift off as the helicopter swoops through the heart of the New York Harbor and right past Governor’s Island. This island was once a military base that’s now been transformed into New Yorkers’ favorite picnic spot outside the city. The tour then crosses the Hudson River to show you Ellis Island and the world-recognizable Statue of Liberty up close and personal. Ground Zero is next and while it’s a somber sight to see, it remains an incredibly relevant part of NYC history. The tour takes a turn after viewing the USS Intrepid, a WWII aircraft carrier, and continues along the Hudson River. It’s here that you’ll be privy to NYC’s famous skyline with close up views of the Empire State Building, Chrysler Building, and the Met Life Building. Other landmarks you’ll get to tick off the Bucket List include an inflight view of Battery Park, the New York Stock Exchange, and the Federal Reserve Bank. See more from the sky in 15 minutes than you could in several days touring New York City on the ground! This tour is recommended for those who appreciate a peek into the past as you’ll get to see several historically significant sites! This helicopter tour of NYC brings you face to face with some of New York’s most stellar sights. Are you ready to be impressed, inspired, and awestruck in just 20 minutes? 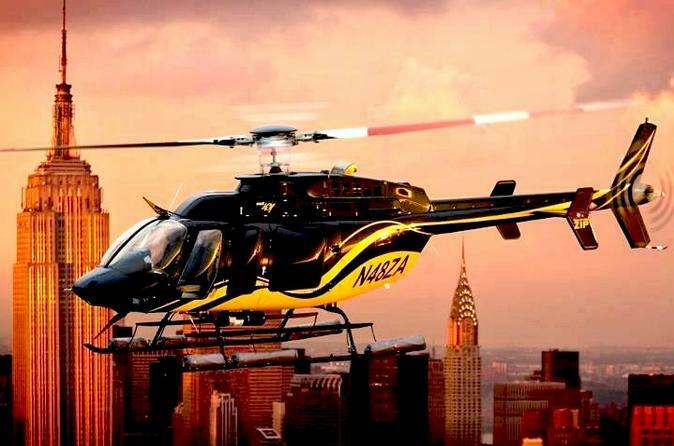 If so, hop aboard the New York Manhattan Scenic Helicopter Tour’s state-of-the-art helicopter for an exceptional view of the country’s most famous city. The tour starts off at the Downtown Manhattan Heliport and first flies over Governor’s Island. The tour then soars over the Hudson River towards Ellis Island where you’ll get the best view in the house of the Statue of Liberty without battling the hoards of people below. The photo opportunities here are once in a lifetime! Ground Zero, the infamous site where the World Trade Center twin towers once stood, is next before soaring up the Hudson to check out New York’s most striking buildings. The Empire State Building and the Chrysler Building are two of the city’s most iconic landmarks and ones you’ll get to see in way most never dream of. 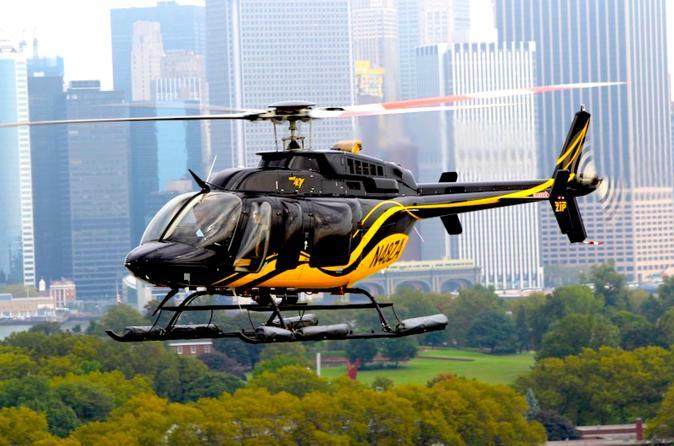 Your tour also allows for views of Central Park, the George Washington Bridge, and the bustling Time Square, making it one of the best helicopter tours of NYC. Lastly, you’ll also catch a glimpse of the USS Intrepid, the WWI aircraft carrier. This tour is perfect for those who desire a longer flight time and are interested in seeing a few more NYC sites. If you’re looking for a romantic helicopter tour for two that’s also one of the most comprehensive tours in the city, you may have found exactly what you’re looking for with this Grand Island helicopter tour. Nobody offers a more complete tour of the Big Apple. This tour covers all the highlights mentioned above in addition to a lot of little extras. With nearly the twice the time in the sky as the other tours, it’s only logical that you’d see twice as much. The start of the tour takes you past Governor’s Island, Ellis Island, and the Statue of Liberty. 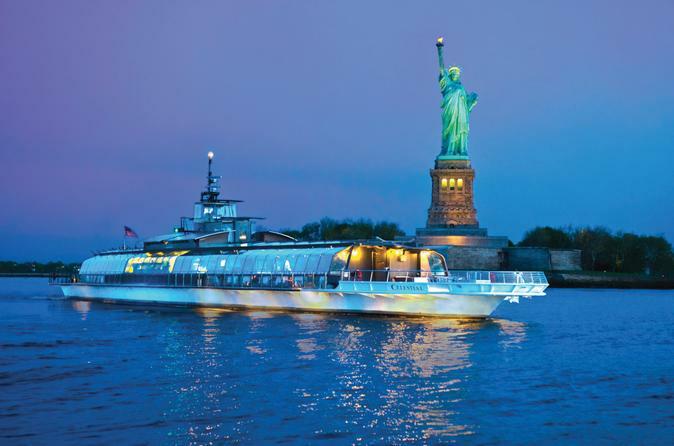 Then you’ll take a turn up the Hudson to admire New York City’s Wall Street. You’ll also get to enjoy Chinatown, Little Italy, and Time Square without having to contend with the crowds. The helicopter tour cruises over Central Park, one of the city’s main fixtures. Now, it’s onto the extra perks. Your helicopter tour will swoop around the bases at Yankee Stadium. Let the Manhattan skyline memorize you with stunning views of the Empire State, Chrysler, and Met Life building before changing gears and flying over the five boroughs of NYC; Bronx, Brooklyn, Staten Island, Queens, and of course, Manhattan. As you conclude the tour, your helicopter will finish by boasting unforgettable views of the United Nations building and South Street Seaport. The grand finale is a one last look at Ellis Island and the Statute of Liberty before returning to the heliport. Whether you’re a first time visitor or a seasoned NYC veteran, this tour will not disappoint. Visitors should take this tour if they’re looking for the most high-class, comprehensive tour of NYC and want to see the most possible sites in one trip. Departure Time: 10am and 5:30pm. Check in is 30 minutes prior to departure time. Includes: helicopter tour, boat cruise, complimentary Mimosa, helicopter fuel surcharge, heliport fees. This combo tour in both from the water and in the air makes it one of the best NYC helicopter tour compilations. If one unique perspective wasn’t enough, this tour gives you two. There are only two tours a day (one morning tour and one evening tour), therefore exclusiveness and excellent service can certainly be expected. This VIP tour kicks off from Manhattan’s Downtown Heliport. The helicopter tour allows for exclusive views of the Brooklyn Bridge, Ellis Island, the Statue of Liberty, Central Park, and the Empire State Building. You’ll also be treated to dazzling views of the entire Manhattan city skyline. The tour pilot will provide commentary the entire time as you view other famous sights like the Chrysler Building, World Financial Center, Chelsea Piers, Time Warner Center, and Ground Zero as you zoom up and down the Hudson River. The sprawling view even reaches as far as New Jersey attractions such as Goldman Sachs Tower, Colgate Clock, and Liberty State Park. You’ll be returned to the base following the helicopter tour and then be swept away on a 1-hour boat cruise through New York City Harbor with a refreshing drink in hand. This time, you’ll cruise under the Brooklyn Bridge and right up to the Statue of Liberty for a totally different but equally impressive perspective of the same sights you saw from the air. Toast to the night out on the town that you’ll never forget with a glass of complimentary Champagne or Mimosa before turning back and concluding the tour at Pier 6. This is the perfect tour makes a perfect surprise for a loved one on a special occasion. This is one helicopter tour for two that has the simultaneous potential for both thrill and romance! There are three major airports in New York City: John F. Kennedy International Airport (JFK) in southern Queens, Newark Liberty International Airport (EWR) in Newark, New Jersey, and LaGuardia Airport (LGA) in northern Queens. JFK is the main international airport along with Newark. LaGuardia typically handles domestic flights although there are some exceptions. You can access Manhattan from any one of these airports, but some are better than others. All three airports also have different transportation options that run the gamut of public transportation to private transport. It all depends on your budget and what kind of trip you have in mind. *We used Manhattan’s Time Square as a central reference point for arrival in Manhattan. JFK is the busiest and most crowded airport with eight terminals and over 150 gates. This is not really the most convenient airport to arrive if your final destination is Manhattan; JFK is the farthest airport at 15 miles away. If you’re trying to save money and don’t have a lot of bags to lug around, you may consider accessing Manhattan via the AirTrain and then taking the subway’s A, E, J, or Z train to your hotel. Taxis and Uber’s are available and run around $50-$60 dollars. There are also several airport shuttle companies, the happy medium in terms of convenience and pricing. Shuttles run from the airport to Manhattan every 30-60 minutes and cost around $20. Book in advance! Newark is roughly the same distance from Manhattan as JFK (15 miles). A taxi or Uber can cost between $50-$70 dollars, making it one of the more expensive options. The AirTrain runs from Newark to the New Jersey City Transit Train which will get you to Penn Station. From Penn Station you can talk a taxi, walk, take a bus, or jump on the subway to access Manhattan. Booking an airport shuttle in advance is a good option. The price is fair for a shared ride (around $23 dollars) and will get you to Manhattan with little effort on your part. LaGuardia is the closest airport to Manhattan and is likely your best bet at only 9 miles away. Airport shuttles from LaGuardia to Time Square are about $16. A taxi or Uber will be less than the cost of one from JFK, but the rate can fluctuate depending on how long you sit in traffic. Public transportation is available in the form of city bus. Get on the Q70 line that passes through the airport and get off at the Jackson Heights-Roosevelt Ave Subway Station. From here you can access the E, M, F, R and 7 other trains. This is not the quickest or easiest way, but it is the least expensive. Try to book your flight into NYC so that you arrive outside of morning and evening rush hour times. This can heavily impact how long your commute will take from the airport to your accommodation. Consider the season, weather, and what you’d like to do before you pack your suitcase. New York has four very pronounced seasons and the temperature and weather can change quickly. A long-sleeved pull over or light jacket is always recommended. Reserve your helicopter tour and anything else you really have your heart set on doing in advance. NYC is one of the most popular cities in the world, and you can bet tours, trips, accommodations, and restaurants will sell out and fill up quickly. If there’s a trip you know you want to take or a restaurant you know you want to eat in, make your arrangements in advance. New York City is world-famous for its nightlife and entertainment. It really is the city that never sleeps. From comedy clubs, swanky lounges, live entertainment and Broadway shows, to dive bars, organized pub crawls, jazz clubs, and night clubs, there is literally no shortage of things to do. The World Comedy Club is a great place to go for laughs. Grab a nightcap in one of Times Squares most up-scale establishments, The Living Room Bar (located on the 7th floor of the W New York Hotel). The Cubby Hole in the West Village is a laid-back fusion bar with no cover charge and unique cocktails for a more casual night out. Libation is a great happy hour spot that offers a glimpse into the true life of the NYC hip hop scene. And there are plenty of adult only shows like Hunk-O-Mania, Burlesque to Broadway, and Rick’s Cabernet New York. There are many options for getting around NYC. The subway system is the most popular and cost-effective mode of transportation. Walking is also a good option as many attractions are jam packed into one place. Taxis are more expensive, but they could be ideal if you don’t want to deal with the hassle of learning the subway system. Renting a car is really not recommended in NYC as the public transportation system is much more convenient and taxis are everywhere. Plus, you’ll have to contend with the traffic and parking nightmare! NYC has budget, mind-range, and luxury accommodations to suite everyone’s style and budget. Five-star hotels with all the amenities and excellent location include The Ritz Carlton Central Park and Intercontinental Time Square. Mid-range options include 3-star hotels and apartments. Some recommended choices are Broadway at Time Square, Resident Inn by Marriott New York Manhattan/Central Park, Radio City Apartments and Green Holiday Apartments. Hostels are the cheapest way to stay in NYC and there are plenty of options for these, too. Check out the neighborhood YMCAs, HI NYC Hostel, and The Local Hostel. New York City sees all four seasons. It’s advisable to visit in the spring, summer, or early fall if you plan to pack in a lot of touring. Hitting the NYC streets in a snowstorm is not as romantic as it sounds! In spring, average day and evening temperatures are around 69 F and 53 F degrees, respectively. Spring sees more rain, so a visit closer to summer may be more ideal. Fall can be cool and crisp and extra layers are definitely needed. The average day and evening temperatures hover around 72 F and 56 F, respectively. Summer is the most ideal time to visit NYC if you want bright sunny days, warm temperatures, and lesser chance of rain. On average, day and evening temperatures are 82 F and 68 F, respectively. There is an overwhelming amount of attractions in NYC, but there are some absolute must-sees. A true NYC experience isn’t complete without admiring the lights of Time Square, visiting the historic Ellis Island and Statue of Liberty, and wandering through Central Park. The MET (Metropolitan Museum of Art) should be toured along with the American Museum of Natural History and the Guggenheim – three of NYC most famous museums. Visit the Highline Park, walk the Brooklyn Bridge, and shop Fifth Avenue for all the top brands. No matter where your interests lie, there’s something to suit every person’s desires in NYC!